We were invited by my wife's uncle last Saturday to see Chronicles of Narnia: Voyage of the Dawn Treader at Trinoma. And I would be a fool to pass up that opportunity.� The movie started at 11am and it ran for about an hour and a half. The movie was great, the cgi effects are believable but it's really not my type of movie. Narnia is geared toward kids and I prefer the Lord of the Rings. Nevertheless, it's still worth watching it. After the movie, we grabbed a bite at Conti's. The restaurant was packed full. We waited for a couple of minutes to be seated. Here are some photos I took of the food. It's not that good looking because I only used a phone camera. Enjoy! 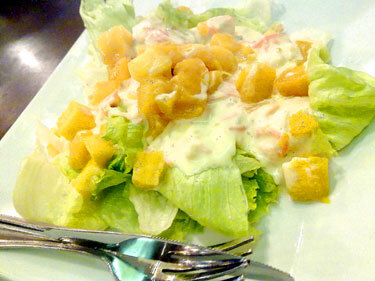 For entree, we had Mango Royale Salad: Iceberg lettuce with fresh mango cubes tossed with Conti's special house dressing. Solo costs PhP 90 and sharing is PhP 160. Yummy with crunchy bits! 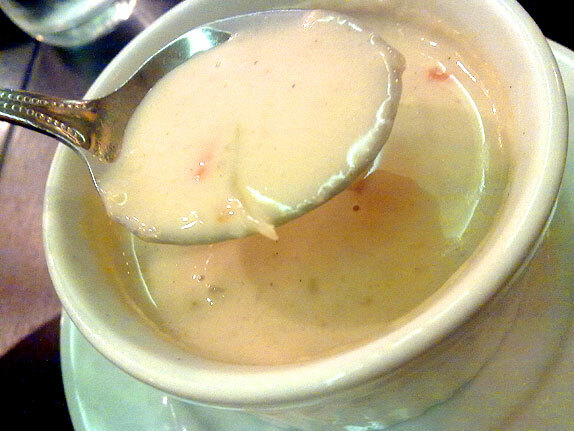 When I dine in a restaurant, it's my habit to always order the 'soup of the day', which is at that time, Cheesy Vegetable soup. They say soup is the gauge how good the food is at one place and I'd say I liked it very much, but I'm sure its just a saying.� It's PhP 80 for a small bowl. 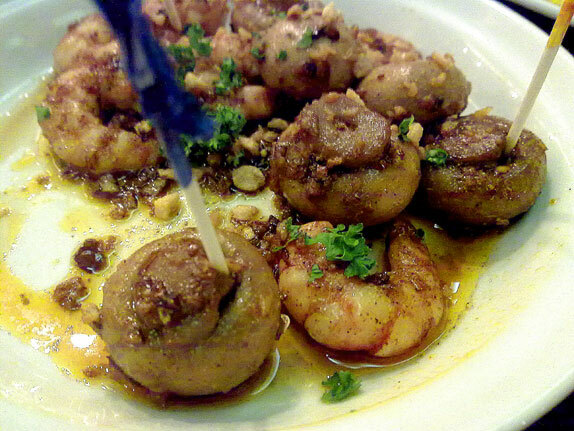 Next is Gambas y Champinon al Ajillo which really is just shrimps and mushrooms in olive oil, it's PhP 175 per serving. Good for 2. But in my case, it's good for 1. 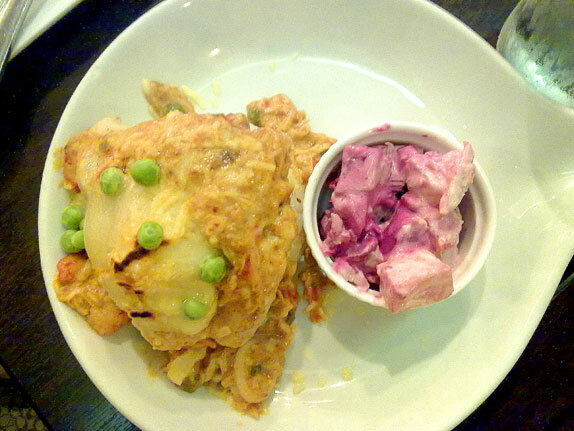 My wife ordered Seafood Au Gratin which is fillet of fish with assorted seafood sauce topped with melted cheese, served over garlic rice, with Russian Potato Salad on the side. It's PhP 240. It's quite salty according to my wife. Must be the cheese. For myself, I ordered USDA Rib Eye Steak. 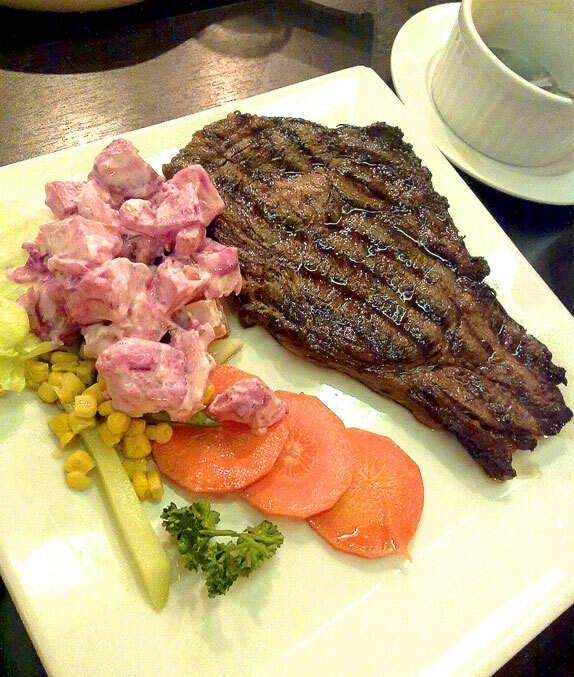 Certified choice of seasoned rib eye steak according to their menu. It's PhP295/100g, I got myself a 280g slab. The meat is very tender, but it's a little short on the taste so you need to sprinkle it with steak sauce to give it flavor.� In short, I've had way better. Steak should be eaten as is, adding steak sauce makes it taste like... um... steak sauce. 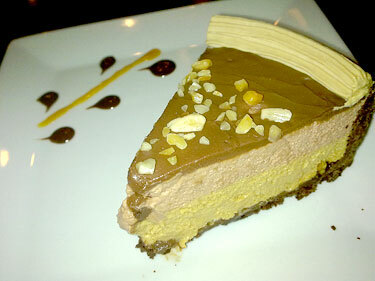 For desserts, we had a slice of chocolate cake but I forgot to ask what cake it was. The cream/icing� is good but the wafer at the bottom is too sweet for my taste. Here's a picture of it. 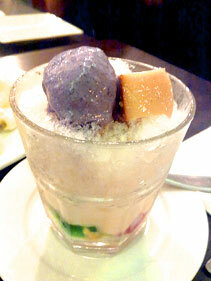 Halo-halo means 'mix'.� This is a popular Filipino dessert that is a mixture of shaved ice and milk to which are added various toppings like sweet beans, jell-o, nata de coco,... topped with ube (purple yam)or leche flan. Conti's in Trinoma is located at P1 Level, Trinoma, EDSA. Precious Eh.. nagutom naman ako! Sayang wala ako to enjoy the steak. Darn it! Marcel Ikaw eh. Kung saan saan ka nagpupunta eh. Marcel Pero sana Mashed Potato na lang sinama nila sa Steak. Parang hindi bagay yung potato salad eh. Weird.